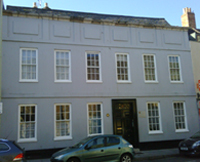 A building has stood on the site in Westgate Street, opposite St Nicholas’ Church, since 1455 and has connections with several notable families. The present timber framed building dates from the 16th Century and it is believed the 18th Century façade was erected by Nicholas Hyett, a local lawyer and Justice of the Peace. The building deteriorated into a very poor condition before some local organisations including the Gloucester Civic Trust stepped in to aid the restoration in 1988. Go back to Gloucester Civic Trust achievements or find out about GCT commissioning the Aviation Murals.